Use your USB flash drive to transfer Windows installation packages from CD or DVD to use whenever a fresh setup of the operating system is required. WinToFlash portable accomplishes an amazing task: it extracts the contents of a Windows installation and transfers it on a bootable USB drive. It can be safely stated that this prolongs the life of your Windows package, seeing as compact discs are highly sensitive, whereas USB flash drives offer you more flexibility. Traditionally, the original editions of Windows come on a CD and utmost care is required when handling the disc. Even the tiniest scratch could affect the integrity of the content and prevent you from running a successful installation. For this reason, it is recommended that you have a backup of the package, preferably on a device that’s more reliable and less sensitive. This is where WinToFlash makes a difference. It seamlessly copies your Windows operating system from the CD or DVD to a USB flash drive. It features support for Windows XP/2003/Vista/2008/7/8 in all editions: Home, Professional, Media Center, Ultimate, etc. Prerequisites are simple: you need a formatted USB flash drive (you can perform this operation from within the application) and the original Windows CD/DVD. 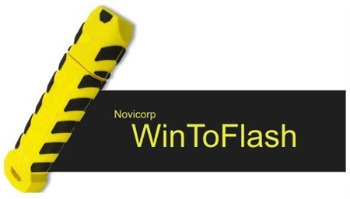 WinToFlash is very easy to use and doesn’t require any kind of installation. Simply run the executable file and configure the first-time wizard in the user interface. After this step is complete, you are presented with two choices. The first one includes running a wizard that guides you through the process and requires fewer steps to be completed. Basically, user efforts are reduced to choosing the source CD/DVD and the output location. The second one sports more advanced options, allowing you to accomplish more complex tasks, such as creating an emergency bootloader, a bootable MS-Dos drive or erasing a disk. The read-only attribute can be removed from the files and you can also choose to collect system information, create a structure for folders, copy files, or check the USB drive for errors. Events can be viewed in the Service tab and multiple language packs are available. The creation of the bootable USB drive takes a decent amount of time and the result is truly satisfying. All in all, WinToFlash seems to be a breakthrough on a market where Windows installations are mostly performed from a CD/DVD drive. It minimizes the chances of losing important data, making Windows editions last a life time. Furthermore, it supports multiboot, meaning that you can add as many bootable items to your USB drive as you deem necessary. Support all editions of Windows – Home, Professional, Media Center, Ultimate, etc. Create aswers file for Windows Setup. Add serial number, user name, etc. Available languages: Albanian, Bulgarian, Chinese, Catalan, Czech, Danish, Dutch, English, Estonian, Finnish, French, Galician, German, Hungarian, Indonesian, Italian, Latvian, Lithuanian, Maltese, Norwegian, Polish, Portuguese, Romanian, Russian, Serbian, Slovak, Slovene, Spanish, Swedish, Turkish, Ukrainian.